I'm going to keep on with the shimmer theme because I have another great oldie shimmer to share with you today. This one is from a Sinful Colors spring collection 4 years back. What's interesting is this is a color we saw variations a lot of that spring/summer. Shimmers were a trend in the spring/summer of 2012. 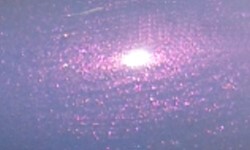 Zeus is a medium muted lavender with a glowing pink-purple shimmer. Color: They don't make them like this anymore. This is a beautiful muted lavender color with a gorgeous shimmer. I hear a lot of complaints this spring about the redundant pastel offerings and how people want more shimmer. This is the type of colors I think us nail polish addicts want again. They're a different take on the spring palette. The colors are still soft, but offer some unique beauty with the shimmer. Formula: This has an excellent easy to use formula. I used 2 coats above. Price: This was $2 at the time, but since this was a limited edition collection, it's no longer available. There were a few other purples from this season in the same vein, but by no means dupes. OPI Dutch Ya' Just Love OPI?, Essie She's Picture Perfect, Zoya Tru, and Zoya Lotus were all purples with shimmers in Spring 2012 that are probably easier to find. Overall: I love this purple shimmer. It's the perfect polish for spring and definitely has me longing for different spring palette than we've been offered the past few years. I love the glowing shimmer and the softness of this color. I especially love this was a drugstore offering. I can't recall the last time I saw a new drugstore nail polish with shimmer in the past 2-3 years. It's all been-there-done-that cremes.